It’s not a crime not to eat some rhubarb pie in spring but, honestly, it ought to be. Rhubarb is one of the season’s sweetest gifts. These crisp, tart stalks that look like ruby-red celery start appearing in the farmer’s market in my suburban Washington neighborhood this time of year. They get snapped up in a hurry by eager bakers, but to the uninitiated they are a bit of a mystery. That’s because rhubarb looks so much like a vegetable — it is in fact a vegetable– and is so lip-puckering sour that someone who’s never tried it before can’t help but wonder how it would fit in with sweets, where it is most often used. Well, I have an easy solution to make you a believer: put some rhubarb where your mouth is. But first, bake it into a pie, like this one I have for you today. 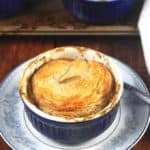 Something magical happens to rhubarb when it is subjected to a high temperature in an oven: it melts into that warm, gooey goodness you have craved all through the cold days of winter. Mix some sugar and some spice into that goodness, and you have a food you will likely get addicted to. My rhubarb pie is very basic: the way I like it best. I just toss the sliced rhubarb with some sugar and vanilla (the sweetness of the vanilla is a perfect complement to the sour rhubarb. Nutmeg would be nice too). And then I bake it up in a classic pie shell with a lattice top crust that bakes up all flaky and crisp. Be sure to let your pie cool thoroughly before you cut it– a rule of thumb for almost any fruit pie. This is because the fruit juices continue to thicken and gelatanize as the pie cools down, and if you cut the pie when it’s still warm you will likely find your plate flooded with still-runny liquid. Not a great pie experience, by any means. I’ve been super busy at work, which you’ve likely guessed from my slow pace on this blog. 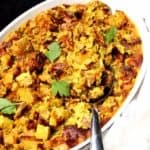 I’m trying to cook more on the weekends so I can share more recipes with you, and I also hope to take advantage of this harried lifestyle to bring you more quick and easy recipes you can make on weeknights for your family. So keep an eye out. I’m still around. To make the pie crust, place all the ingredients except water in a mixing bowl. Using a fork or a pie-cutter, cut the butter and shortening into the flour. You should have a coarse mixture with fairly large-- about pea-size-- pieces of butter and shortening in it. Drizzle the water a little at a time into the flour and mix rapidly with a fork until the dough comes together. Be sure to keep all your ingredients as cold as possible. Divide the dough into half and wrap each half tightly in plastic wrap. Shape each half into a disc with the palms of your hands as you wrap it. Refrigerate for at least 30 minutes to 2 hours. To make the filling, place all the ingredients in a mixing bowl and mix thoroughly. Set aside for at least 15 minutes. To roll out the pie crust, take one of the discs of dough from the refrigerator and roll into a disc large enough to fit into a 9-inch pie plate with some overhang. Fit the dough into the pie plate, pressing the dough into the corners, and place in the refrigerator while you roll out the top crust. Roll the other disc of dough into a circle that will fit on top of the pie plate with a slight overhang. Using a pizza cutter or a knife, cut the circle into long strips. Pour the filling into the bottom crust, mixing one last time before you pour it in. To form the lattice, place half the strips across the pie, at roughly 3/4th-inch intervals. Fold back alternate strips and place a strip across those already in place. Unfold the alternate strips, fold back the remaining strips, and place another strip across the pie. Continue doing this until you've used up all the strips of dough. Place the pie in a preheated 425-degree oven and bake 30 minutes. Then slide a baking sheet under the pie and continue baking for another 35 minutes or until the juices are bubbling through the lattice top. Remove to a rack and cool the pie thoroughly before eating. This takes some time-- about 4-5 hours-- so be sure to plan accordingly and avoid the temptation to cut the pie before it has cooled. 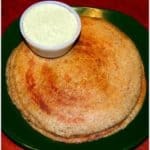 « Vegetarianism: A New Tool for India’s Radicals? Chitra, the kitties are cute indeed, and they give us a lot of joy. And rhubarb pie is quite a treat, if you have a chance to try it. Lovely pie recipe, Vaishali. I wonder if strawberries would go well with the rhubarb? I’m just saying cos I love strawberry-rhubarb jam. Sangita, Rhubarb and strawberries are a perfect combination, and they are also great together in a pie. Hope you try it! Hey Jan, yes, you can replace the shortening with vegan butter like Earth Balance, but make sure it remains very, very cold. If it melts too much, you won’t get a flaky crust. Seriously wish to have a slice anytime,yummy pie. frst time to ur space….glad to follow u! Hey thanks for this lovely Rhubarb pie. 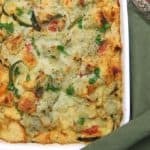 it’s amazingly recipe great posting. thanks for sharing. I m loving it. Thanks for the fantastic recipe, I got REALLY hungry when I saw it 🙂 Will try this asap. Cheers! where are you Vaishali? long time since you posted. I hope everything is OK with you. Health wise and otherwise on the personal front. I hope it is only some good news that is keeping you busy and away from blogging beautiful recipes. Take care of yourself and your loved ones. Manu, thanks for your concern– I appreciate it. Lots of things have been happening, some good, some not so good, and I promise to share it all soon in my next post which should not be too far away. I too miss you all. I still have yet to cook with Rhubarb, every time I see a recipe with something I have not tried, I make a note to try it. I admit, it is still in my to make list. Looks so yummy as always. How have you been? I am slow in blogging lately to blog and read up my favorite blogs too. 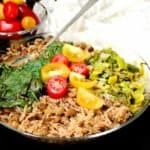 I found your blog a couple of weeks ago, as I am only just becoming Vegan. 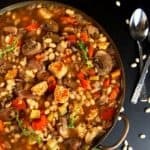 I hope you are still going to post, as this is one of the best sites I have come across, and I love all your recipes! I understand this must take up so much of your time, but from what I read on the comments, everyone loves you! Thanks so much for all your hard work. M-A from Australia. M-A, thank you! You are so kind. I do plan to continue blogging– I miss chatting with all of you too, and I can’t wait to put up another post, hopefully very soon. Hi. 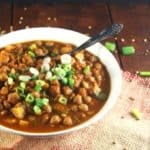 I have a question, since this is a vegan recipe website, it’s guaranteed that every item in your recipes will be vegan, right? So why do food items like butter have to always be mentioned that they’re “vegan butter” or “vegan xyz”. Isn’t it GIVEN that all the items will be vegan? Isn’t it redundant to keep stating how certain items are vegan or are from vegan brands? Hi there, since items like butter are not usually vegan, it’s helpful to spell that out. On the other hand, I wouldn’t specify “vegan” for foods that obviously are, like soymilk or tofu. I made this pie and replaced the tapioca with corn starch. It turned out beautifully!! Thank you so much. I am making this again but adding strawberries too. 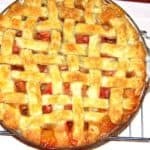 This is my go to recipe for rhubarb pie and any variants.